Dave Rees and I have been waiting for what feels like years in gadget time for the Nexus 6P. We each ordered one on the day they were announced and waited over a month to receive them. During that time, Dave had second thoughts about the 128GB version and cancelled in favor of a 64GB version. Then we both almost cancelled over the phone bending drama at the end of last month. Julie: I’ve personally been wanting to upgrade to a new phone from my LG G3 which I’ve been using since August 2014. I really like the phone, but it started to act a little flakey and slow. So much so that I actually got a refurb replacement for it. That refurb has been working well for many months, but now it’s starting to exhibit some of the same strange behavior of my original – so it’s time for a new phone. Dave: Yes, the wait was just this side of painful. I have been using a Samsung Galaxy Note 4 for nearly a year. Unlike Julie, other than factory resetting it once, my Note 4 has been relatively rock solid. I am glad we did not play into the hype of that infamous 6P destruction video and cancel our orders. I’m also pleased I decided to go with the 64GB graphite version. Seems to be the best bang for the buck. It’s a shame that Google decided to make the jump from 64 to 128GB a $100 bump. 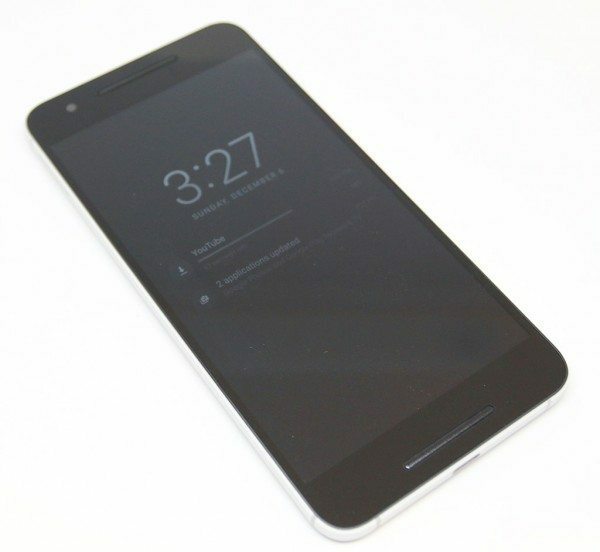 Julie: The Nexus 6P has a high-end look and feel. The front of the device has no branding and no buttons. Above and below the display are front firing speakers that make watching video a real pleasure. The edges are beveled and polished. The back of the phone is slightly rounded with beveled and polished edges. The camera “bump”, microphone, and the fingerprint scanner are all located on the back of the phone. I was worried that the bump would be really noticeable but it’s really not that bad all. Dave: From the design and usability points of view, the Huawei and Google engineers have created a nearly ideal device for me. From the placement of the fingerprint scanner to the front facing speakers, the 6P is the most ‘useable’ smartphone I have ever tried. Julie: On the left side of the phone you’ll find the nano sized SIM card slot. Julie: On the right side of the phone is the volume adjustment button and the power button. Both buttons have good tactile feedback and an audible click when pressed. The volume button is smooth and the power button has ridges. Julie: On the top edge of the 6P you’ll find the earphone jack. Julie: On the bottom edge of the phone is the USB Type-C port. One of my major disappointments with the Nexus 6P is the fact that Google decided not to include wireless charging capability. Instead they opted for fast charging through USB Type-C. This is the first USB Type-C device that I’ve used. I do like that the cable can be inserted easily in either orientation, but that doesn’t make me miss wireless charging any less. Dave: I will miss wireless charging too without a doubt. But let’s face it, wireless charging was anything but fast and on occasion a bit flakey. That said, the Nexus 6P’s quick-charging is really fast and the USB Type-C port feels much more solid than a typical microUSB connection. Both pluses in my opinion, well worth the minor inconvenience of having to plug it in. Dave: Android hardware has come a long way in the past few years, from mediocre plastic and marginal screen quality to metal, glass, and QHD. From a material and construction standpoint, the 6P is by far the best Android smartphone I have ever used or even seen. The 6P’s metal housing and Gorilla Glass 4 covered QHD AMOLED screen are definitely up there with the other flagship devices (including the iPhone), perhaps even leading the way. Julie: Although the 6P is made of anodized aluminum, the back of the 6P feels more like plastic than metal to me. I think it’s the finish that has been used. Even so, the 6P feels very solid and has no problems surviving my Gadgeteer squeeze test without flexing, creaking or even bending – thank goodness! Dave: The Nexus 6P is definitely a healthy sized phablet though it’s 5.7 inch screen is pretty standard in that category these days. Thankfully Google listened to the masses that its 6 inch predecessor was just too big. The 6P is thinner, more narrow and a bit longer than my Note 4 giving it an excellent form for my not so small hands. 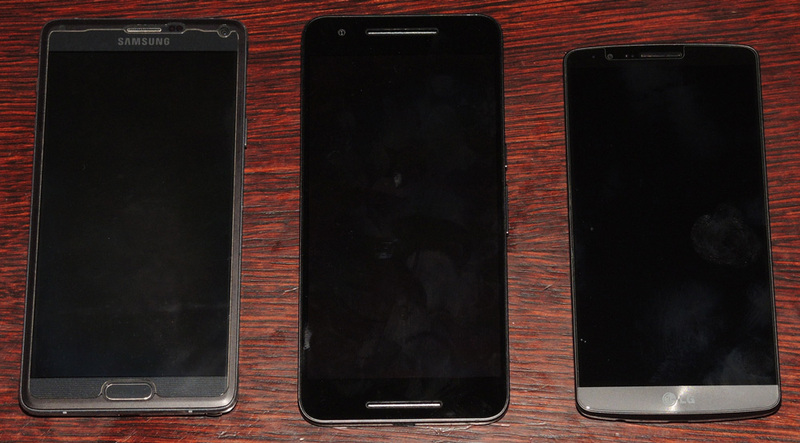 While the bezels could be smaller, the screen size to device size is excellent. Julie: In addition to Google’s decision not to include wireless charging, a microSD card slot and a user-replaceable battery, I was worried about the size of the 6P when I ordered one. Having carried a LG G3 for the past year, the 6P feels noticeably larger even though it’s only about a half inch taller. You can see the image above, which includes a Samsung Galaxy Note 4 on the left, the Nexus 6P in the middle and a LG G3 on the right. In hand the phone doesn’t feel too large, but carrying it around is a challenge for me because I don’t carry a purse. I typically slide the phone in my back jeans pocket or side cargo pocket when I’m walking around at my day job and even at home. The LG G3 always poked out of my pockets at least an inch, but the 6P obviously pokes out a lot more. So much so that I’m a little leery of carrying it around that way. The 6P is a bit too large even for some of my jacket pockets. Since I don’t wear belts, a holster is out of the question, not that I’d really consider one in the first place. Dave: Funny thing is, I do take my smartphone’s size and how/where I am going to carry it into consideration when purchasing clothes. Julie: That’s easier for men because their clothes have larger pockets than women’s clothing. I’ve been trying to figure out how to add a pocket to my existing jeans and pants without making them look weird. Julie: I have no complaints about the display. It’s bright with vivid colors and sharp graphics. Remember when you used to be able to see each individual pixel on a phone’s display? You can’t do that with this screen. I also like the active display feature which will show the time, date and any new notifications when you pick up the phone. It’s not quite as nice as Motorola’s active display feature which allows you to just wave your hand over the phone’s display to show the info. With the 6P, you have to pick up the phone and I’ve noticed that it doesn’t work 100% of the time. 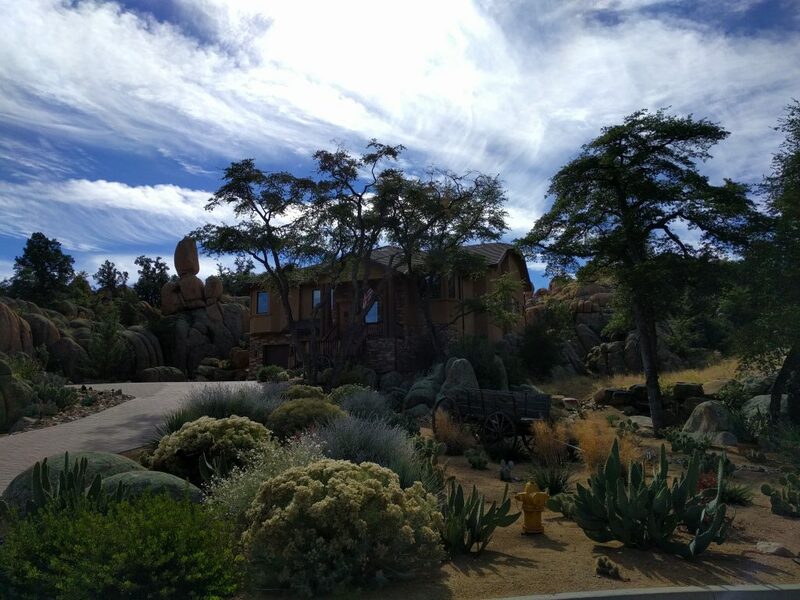 Dave: After using both the Samsung Galaxy Note 3 and 4 with their oversaturated colors, the toned down, warmer look of the 6P is nice. After using it for a couple of weeks, I definitely prefer the more subtle user interface. Yes, I agree the active display is a great feature saving time and effort if you’re just checking the time or a notification. Julie: The fingerprint scanner on the back of the 6P is the best one that I’ve ever tried. I usually have a lot of problems with fingerprint scanners, but this one works almost every time. I also really like that you can set it so that just touching the scanner will wake up and unlock the phone without having to press the power button first. So to use the phone, all I have to do is pick it up and touch my index finger to the back and boom, it’s ready to use. 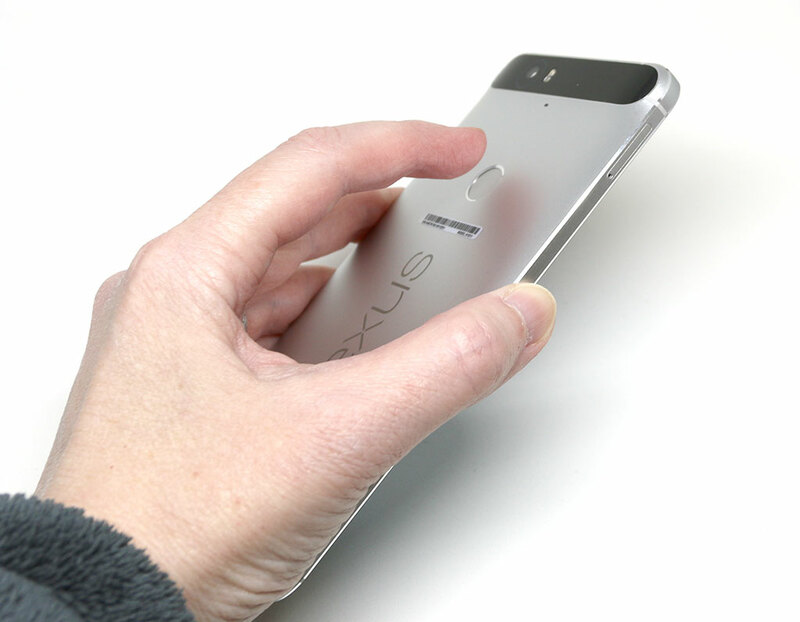 Dave: Yes, the fingerprint scanner is definitely one of the best features of the Nexus 6P…quick, easy and highly accurate. Dave: Along with the Nexus 6P bendgate, there has been some initial controversy regarding Google/Huawei decision to not include image stabilization technology that is more or less standard in today’s flagship phablets. I was a bit concerned because I use my smartphone camera a lot. But I have been nothing but impressed with the 6P’s camera. Here are several pictures I took while vacation visiting my father in Arizona that involved nothing other than pointing and shooting. Julie: I’ve noticed that the camera is blazing fast at capturing and saving photos. I like that I can use the volume button as a shutter button. Since I’ve been using the LG G3 with the volume buttons on the back side, having one on the side makes snapping pictures easier than tapping a button on the screen. Dave: I know there are many variables that go into this statement, but I do believe the Nexus 6P has better reception and call quality than either my Note 4 or LG G3. With it typically showing, one bar greater than what my other phones usual had. The WiFi reception was good, with no issues or complaints. Julie: I agree that the 6P has no problems when it comes to cellular and WiFi connectivity. I tested the phone on the Verizon network and on my own 2.4 and 2.5 GHz WiFi networks at home with no issues. 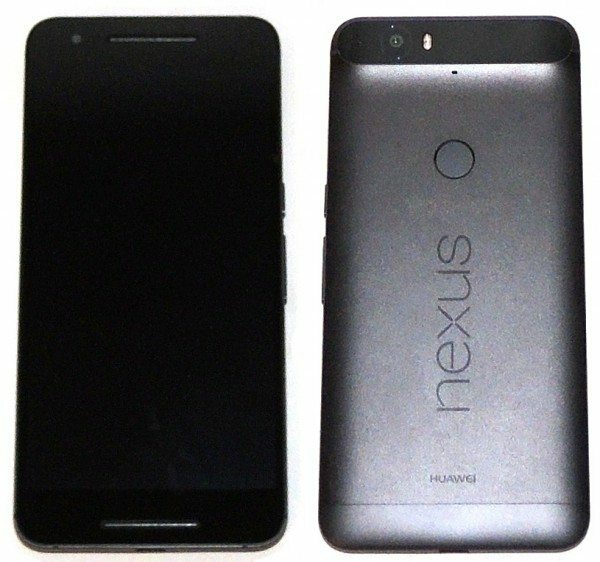 It’s important to know that the Nexus 6P is an unlocked phone. That means that you can use this phone with any carrier including Sprint, Verizon, Tmobile, AT&T and more. Dave: The battery life is stellar. I make it through a high use day with about 25% left to spare. Plus when the battery low and I’m headed out the door, in the time it takes me to make an espresso the quick-charge is able to give me well above 50%. Julie: I’ve had the same experience with battery life and have no complaints. When I was using my LG G3, I would put it on a Qi wireless charging dock next to my bed. With the 6P I just leave it on my night stand unplugged so that I can pick it up during the night if I want to see the time. I just make a point of charging the phone for a few minutes before I go to bed at night just to make sure that it won’t die before morning. So far that’s not been a problem. The Nexus 6P has a special low power mode that helps conserve battery life when it gets too low. 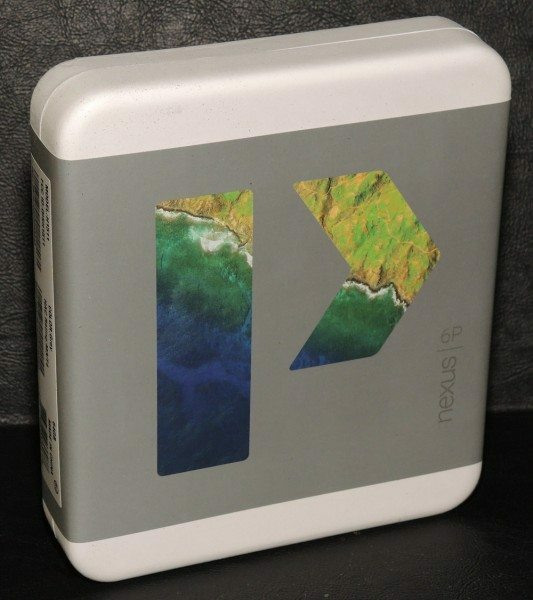 Dave: Using the ‘pure Google experience’ was one of the major considerations for trying the Nexus 6P. 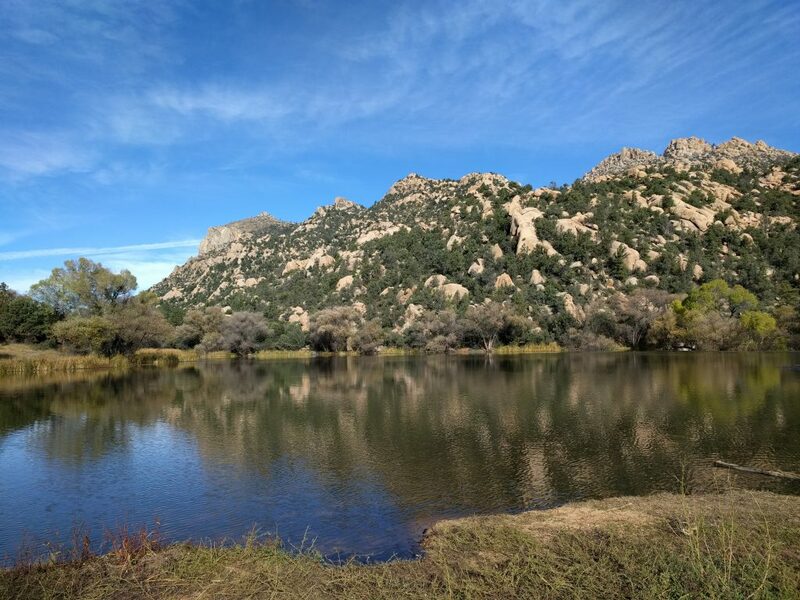 I was tired of and frustrated with the lag-time between Google releasing an OS update and the time it took to showed up on my smartphone…if it did at all. The path from Google to Samsung to my carrier to my device took months and months and months. Each of them adding their own shellacking and bloatware to only slow and clutter my device, adding no real value. So far Marshmallow has been great to use, zippy and fast with zero lag. Julie: I completely agree. A smartphone that comes with junk software that I’ll never use and that I can’t uninstall makes me unhappy. With the 6P there is a lot more room to install the apps that you’ll actually use because all you get are the base apps instead of apps that the carriers include. 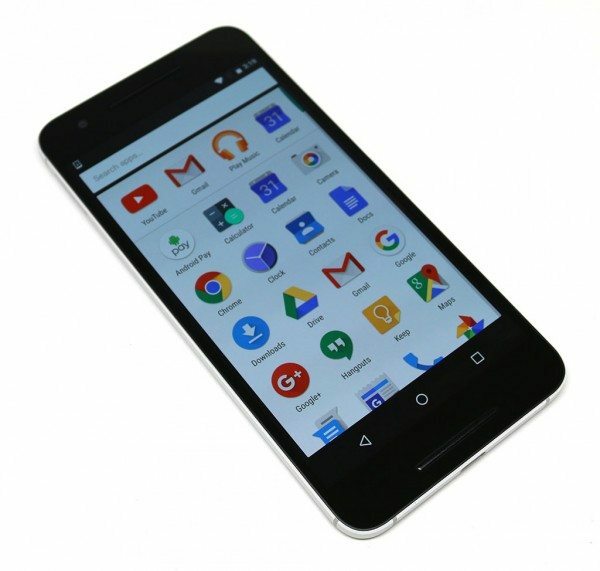 Julie: I have no problem saying that the Nexus 6P is the nicest Android smartphone that I’ve ever used (so far). It’s lightning fast at launching apps, switching between them, scrolling through long web pages, etc. The camera takes fantastic pictures especially when you’re in low light situations. The front firing speakers really improve the experience of watching videos using the phone and the battery life is above average. I can deal with not having a user replaceable battery and even the lack of a micro SD card slot. But I really miss wireless charging because it’s so easy to just set the phone on a dock to charge it instead of plugging in a cable that looks sloppy and gets in the way. I also wish that the back could be removed so I could put an iOmount steel disk in between the back cover and the battery. I use an iOmount mount in my car and enjoy how easy it is to just stick my phone to the holder. To do that with the 6P would require that I use a cover or case with it if I didn’t want to see the disk (which I don’t). I hate cases, so there’s that. The size / length of the phone almost made me reconsider switching to it from my LG G3, but I’m adapting just like I did when I thought the Samsung Galaxy Note 2 was too large a few years ago and I ended up switching over to it. Dave: Like Julie, the number one feature I will miss is wireless charging. I have Qi stands in all of my spaces to not only give my smartphone a place to be but when I pick it up to go, I know it has more battery charge than when I got there. But the 6p’s stellar battery life does enable me to make it through a day of heavy use on a single charge. And even if I am running low, it’s quick-charge feature enables me to power up in the blink of an eye. I will not miss the replaceable battery or microSD card feature at all. I never removed either one…ever. All of that said, I love the Nexus 6p and will definitely be keeping it. Without a doubt, it is the best smartphone I have ever used. The 6P’s build quality, lighting fast performance, fingerprint reader, and pure Google OS are well worth what little I am giving up with my Note 4. Julie: Well, it’s been almost five months since we posted our review of the Nexus 6P and we’re both still using this phone. Dave: Yep but time continues to flyby and with that the never ending temptation of new smartphones. Julie: For me, I’m still enjoying the 6P but I continue to miss wireless charging and am not happy with the lower audio quality when paired with Bluetooth devices/headphones/speakers because the 6P lacks the aptX codec. See this Reddit thread for more info on that. Dave: I continue to love the Nexus 6p and have learned to live without wireless charging, using its quick charge capability when needed. The 6p’s form factor, front facing dual speakers, and pure Android experience give me a great smartphone experience. Julie Although I’m happy with this phone, I’m still looking for my next new smartphone fix. When we reviewed the Samsung Galaxy S7 Edge, that one didn’t trip my trigger and now the LG G5 which I’m currently reviewing isn’t either (sorry, review spoiler). Dave: While I occasionally get tech-bored, none of the new smartphones this year have even come close to pulling me away from my N6p. 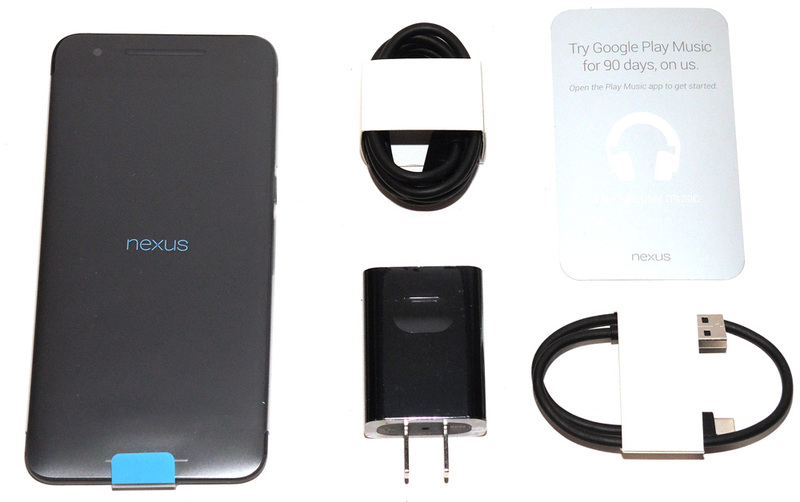 That said, I do look forward to the next batch of phablets and Nexus devices due out in the Fall. I bought an iPhone 7 with intentions of replacing the Nexus 6P. That test didn’t work out. Then I bought the Google Pixel XL. Loved the Pixel but it was too much money and not enough changes over the 6P, so it went back too. That means I’m still rocking the 6P and I’m fine with that for now. Why replace something that works great if I don’t have to? Dave replaced his Nexus 6P with an iPhone 7 Plus and hasn’t looked back. After about 1.5 years using the Nexus 6P as my primary phone, I finally upgraded a couple weeks ago to an LG G6. The Nexus 6P has been sent to a new home, so it continues to be used which is great because it’s one of my favorite phones. Source: The phones for this review were purchased by Dave and me with our own funds. Great dual-perspective review, thanks! I’ll add this phone to the short list of candidates for my next phone, which right now includes the Note 5, rumored-but-not-delivered Note 5 Active, and possibly the iPhone 6s Plus. I’ve really been looking forward to wireless charging, but at least if I get the 6P I won’t be losing something that I already have. Thanks for catching that mistake. Hey guys, nice review! I’ve been using the Nexus 6 for about one year now. I know that you have also tested the Nexus 6, Julie. Are these two phones drastically different and is it worth considering upgrading to a 6P and why? I’ve been very happy with my current phone (speed has been great) even though I don’t care much for the camera. I usually get by using another camera. No, they aren’t drastically different. But… I’m assuming you already have Marshmellow on your Nexus 6. If you like the way it performs and don’t want to lose wireless charging, then I wouldn’t recommend updating to the 6P. 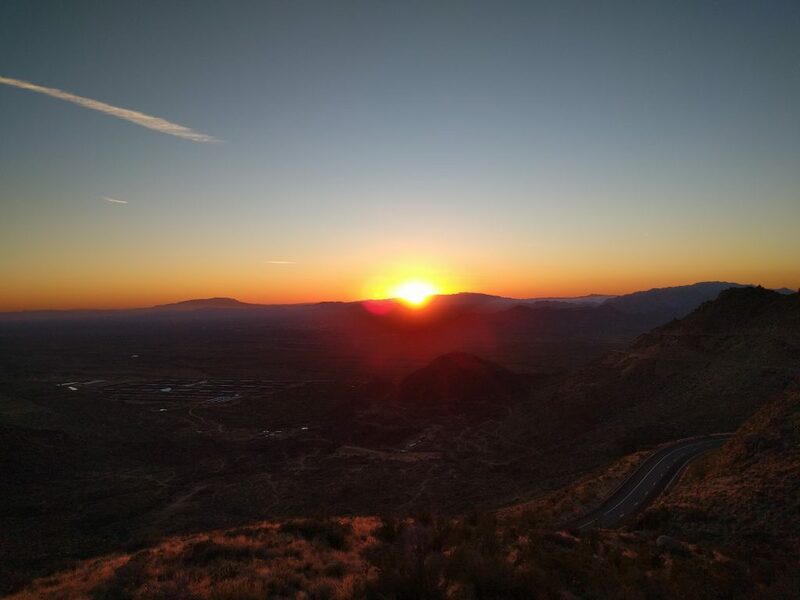 But if you want a better camera, a fingerprint scanner and a flat phone instead of a phone with a rounded back, which is an important feature for me because it makes the phone more secure on my magnetic iOmount car mount, then an update to the Nexus 6P will get you the best Android smartphone currently on the market right now. I do like the way phone performs (yes, I’m using Marshmellow) and would miss wireless charging. I even like the rounded back of the phone – it just feels more comfortable in my hand compared to flat back phones. So, I guess I will stay with my current phone. Thanks for the info! I also wanted to ask if either of you are having issues with Bluetooth on the Nexus 6P phone? Since upgrading to Marshmallow, I’ve been having some minor issues with Bluetooth having problems connecting automatically to devices, which are temporarily fixable by toggling Bluetooth off then on again so all my Bluetooth devices work, but it’s annoying. So far I’ve not noticed anything. Hopefully Dave will chime in too. Hi Kathleen, no I haven’t had any Bluetooth issues @all. This past month I’ve used my N6p to review several wireless earbuds, connect it daily to my iShower, and this past wk connected it to my rental car…all worked and reconnected perfectly. It would appear to be just me (as usual it seems). *sigh* Thanks for the info! My 6P received the 6.0.1 update today. I can’t tell much of a difference other than new emoji! 😉 But yay for not having to wait for eons for an OS update!